It’s Election Day in the United States, and most of the country probably needs a break from politicians after months of dueling campaign ads and heated debates. But something to watch for next time: which hand does a candidate use to gesture when delivering the good news? 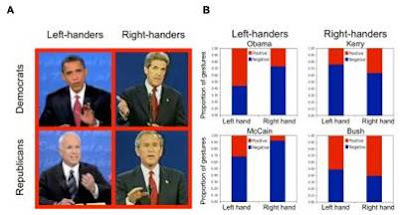 After scrutinizing video from the final 2004 and 2008 U.S. presidential debates, researchers found that right-handed politicians—in this case, Massachusetts Senator John Kerry and former President George W. Bush--tend to gesture with their right hands when they’re speaking positively. Their left hands spring into action when they have something negative to say. But just the opposite was true for the 2008 left-handed contenders, Arizona Senator John McCain and now-President Barack Obama. They gestured with their left hands when they said something positive, and saved their right hand gestures for negative speech. It’s a striking finding, particularly given the strong associations that “right” has with ideas such as intelligence, honesty, and goodness across cultures. But something deeper—and more personal-- is at work here, said Daniel Casasanto, a neurobiologist from the Max Planck Institute for Psycholinguistics in the Netherlands. In their report published in the journal PLOS One, Casasanto and psychologist Kyle Jasmin at the New School for Social Research in New York suggest that this “body-specific” association is mostly unconscious. Presidential candidates—and the rest of us—don’t wittingly link their dominant-side gestures to positive speech. But those gestures could be useful for those of us trying to decipher a speaker’s true feelings. “If listeners can track which hand a speaker uses to gesture,” Casasanto said, “they may be able to receive subtle clues to the speaker's attitude toward the things they are talking about.” Of course, he added, a listener would have to know if the speaker was right-handed or left-handed. In this case, right and left don’t appear to have anything to do with “right-wing” and “left-wing” political leanings. If you’re right-handed, right is good—no matter what your campaign ads say.